Designers have to undergo a lot of challenges in their entire career span, throughout the very start they begin to explore the design world, they perceive ideas, formulate them and their imagination works a great deal for them, this field is a magic in itself because it does not make one bored of it. New day, new projects, new aims, new hopes and new plans make up the routine of a graphic designer who does all in a very professional way. It so happens when you do something from your heart, it reflects, it not only gives you peace and satisfaction but also develops a level of confidence in yourself that how to confront the challenges, how to maintain grace under pressure, how to respond to the new ideologies and how to try ones hand at new techniques that can pay off in the long run. I have been searching out some inspirational posts for designers because my blog is all about helping the artists who are newbies, who are at their learning phase, who are good at various genres and even for all the experts who want to keep a check on the design and art world’s latest trends & happenings. Now talking about my today’s post which is going to help you if you are dealing with a client for his advertisement purposes. 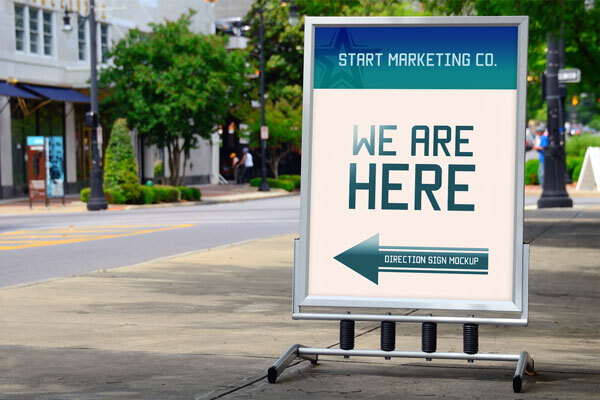 Here I made a free outdoor advertisement direction signage mock-up in which you can insert your design element to show it to your client. This direction sign is helpful for all those people whom you want to give implication about your office’s location, people usually get deviated and go on the wrong side, so this direction sign will provide them a route check (board bearing a sign hinting at the destination). This mockup is great if you use it wisely in the presentation for your client. In this way he very well have the clue how the advertisement direction sign will look in tangible form. For more posts don’t forget to subscribe to us, we will be looking forward to your feedback as well. Thank you very much this mockup was much helpful.